A Friend, a word, today…. – And All That Carry On…. I love words. Spoken or written they intrigue me and I collect them to use at my pleasure. I especially love words that are new to me and feel exhilarated when they find their way into my vocabulary with ease. Words have great power and I suppose it is a strength of mine to articulate with precision and color. I have a lovely friend who appreciates my words and the way I weave them. We speak daily, tuned in to our shared middle of life experience, and often she will look to me to help her accurately articulate a feeling. Her charming tendency is to race around words to find precision, and in hesitation I can almost feel her mind searching for just the right one. In those conversational pauses I am usually quick to what she seeks and her enthusiasm for that never fails to make me smile. “Exactly! Perfect word!”, and on she goes with the observation of the day, my word facilitating the advancement of today’s story. It’s a wonderful ying to her yang; I feel clever, and she, heard. 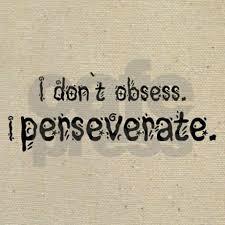 There is a word she used one day to describe what I have been doing now for over a year: perseverating. “Can you repeat that?”, I said with a “hmm” in my brain. I loved the sound of it, but candidly, was unfamiliar. “You know, perseverating, letting a thought or pattern repeat and repeat, like an obsession.” Well, I didn’t like the sound of obsession, which to me is a dark and stormy word. It reminded me naturally of the dark and stormy person on whom I had been, well…….perseverating. And so, my friend who looks to me for the perfect word, had found one I didn’t know. In that whisper of a word she captured with exactitude the thing that has been undoing me. I am perseverating; I am hostage to perseveration. I never used to perseverate. I am a woman of action; a doer, an engager and above all else an extrovert. I lead, coach and teach and when the annual physical arrives, I am told that I have the blood pressure and heart rate of an athlete. I am emotive, rarely one to hold feelings hidden. I say what I mean and mean what I say. Until a year ago, I think I understood the journey of my life; nothing simple in it, but it’s winding places made sense to me, and the changes in it the result of my personal evolution. There was no puzzle to it that I could not figure in reflection. The path of it not always easy, but my confidence never abandoned me. I lack confidence these days. I am, for the first time in my life, wholly unsure of what will happen next. I have trouble seeing the future with optimism. I cannot stop my racing mind from continuing its race, regardless of audible books on “mindfulness”, and the “mindful” attempt I make to focus on doing the things that make me happy and highlight my strengths, like watching over Uncle Bobby. There sits in my virtual space this rubik’s cube that I cannot seem to put down. A rubik’s cube of someone else’s tormented mind which has muddled my own. No matter how many times I revisit that cube, I cannot find its solution. The Rubik’s cube is simple to deconstruct, and it can be done so quickly. Just a twist here and there and the harmony of colors are dismantled. It is shocking just how fast a rubik’s cube can be undone. Even in the replaying of the deconstruction, it is almost impossible to find the simple solution; to get everything in it’s place, to restore its balance. Perseverating on the cube is an exercise in frustration, and the more you tinker with it, the more frustrated you become. I thought I had a mind for puzzles, but this particular Rubik’s cube is wired for failure. This cube, which sat by me in perfection for nearly two years, suddenly became undone and it is hard not to perseverate on what I did not see coming, on what I had no power to put back together. Throughout my life I have been good at problem solving, circumventing crisis, surviving the heartache of loss and tucking it behind me. This time, my intuition and coping skills have failed me. My innate strength is no match for that particular beast and all I understand in retrospect is that I was foolish to think I would not be damaged by it. Its cruelty knows no bounds. maybe if I dance fast enough I won’t remember what I’ve lost”. I think I’ll perseverate on that for a bit and see if, within it, I can find a way to get to the other side. Pingback: A Friend, a word, today…. | And all that carryon…. Wow I thought you were talking about me at first because you know it’s all about me ha ha! Seriously often I’m grasping for the right word and you always come up with it. And I agree with the philosophy that dancing is always the answer! Did I say dancing? Well of course you’re in. You are always head if the conga line!